Tourist Information Centre Walk 43 at Thurne to Clippesby01493 846346work Walking RouteThere are two choices for the Thurne to Clippesby Walk - the full loop is a 6.7 mile (10.8km) circular walk starting at the Lion Inn public house in the village of Thurne near Great Yarmouth or a shorter loop is possible for a walk of 4.5m (7.2km). 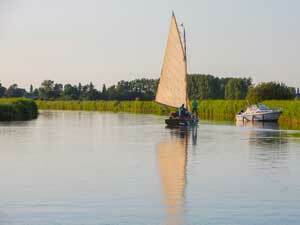 This is a lovely rural circular walk taking in views of Thurne and Clippesby. A quick diversion along Thurne Staithe to look at the windmill is always well worthwhile. Public facilities are also available along the Staithe. There are two choices for the Thurne to Clippesby Walk - the full loop is a 6.7 mile (10.8km) circular walk starting at the Lion Inn public house in the village of Thurne near Great Yarmouth or a shorter loop is possible for a walk of 4.5m (7.2km).